Today's homeschool topic is on home management. That seems an ironic topic for me, as I never feel like I quite have my home managed. But then, when I think of all the things that come under the umbrella of home (my home business, our homeschool, our garden, the cleaning, the meals, appointments, etc.) I realize that I do a pretty good job! So what are my best tips for managing a home like ours -- one with 6 kids and so many responsibilities? 1. Manage your expectations first. Yes, that's right. I would love a home with matching throw pillow, shiny countertops, and the smell of fresh lilac. But since I have been pregnant or nursing AND working full-time from home for over 10 years, I realize that these things are not the most important things to focus on. My expectations have become pretty basic, and I focus on laundry, meals, clean kids, schoolwork, business, and the bare essential cleaning and maintenance. This means our home is rare company-ready, but we can be happy and function and honor God with our actions. 2. Be hospitable when (and where) you can. Managing a home to some people means having the ability to take in houseguests at a moment's notice. I wish we could be like that, but since our home is also our school and our place of employment, it's not reasonable (or healthy.) Imagine if you went to a public school unannounced and told the teachers there that you wanted to sit and chat with them for a few hours instead of allowing them to teach? Or if you went to a friend's job and said "I'm just going to visit for the afternoon. Do you have cake?" Don't feel that you need to drop everything for drop-in visitors. If someone can't give you 24 hours to accommodate a visit, you need to set that expectation. I find that it takes about 5 hours to get our home from "disaster" to "yes, you can come in." And I'll even have cake! 3. Enlist your kids and spouse. I find it incredible that so many moms are overworked and stressed out -- like me -- but that they are also overlooking their greatest weapon in the fight to manage the household: kids. While I don't have a 2-year-old that can wash the dishes (nor do I want him doing that), I do agree that there is an acceptable list of chores kids can do for just about every age. 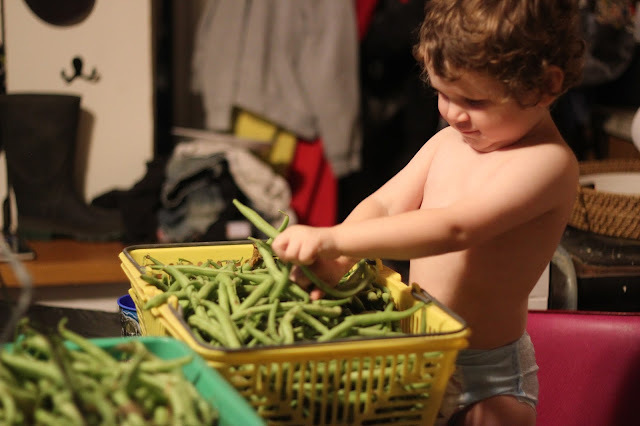 Even the less-motivated kids can do things like play with the baby, match socks, or pick green beans, so I can work. How do I motivate them? I found an audio lecture from IEW's Andrew Pudewa to be incredibly inspiring and accurate. Kids like games, especially those that have a potential risk and reward. I usually give my kids a list of things to do each day (from schoolwork to chores) and let them know that -- if they finish everything on their list -- they get a reward (movie night or video games.) But, if they don't, they have to go to bed early or give up dessert. It is incredibly motivating, especially paired with a good household management tool for kids like the Zone Cleaning for Kids Clean 'n Flip chore list! 4. Make room for life. This summer has been crazy. My husband fell ill with a mysterious virus that left him in bed for almost 3 weeks. I then got the flu, along with all the kids. I spent a good part of 2 weeks preparing my grandmother for heart surgery, including the 2-hour drives back and forth from the hospital. We had a garden that overproduced, hens that went rogue and hatched out babies all over our yard, and 3 last-minute trips for the blog that weren't originally on our calendar. If you don't give kids time to rest, they'll take it whenever and wherever. "Manage your expectations" yes, this. This is what I need to remind myself to do. Thanks for sharing!